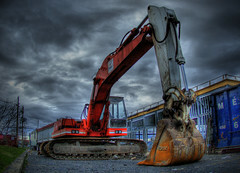 Often, during large-scale construction projects heavy equipment such as bulldozers or front-end loaders are left on site overnight or after hours. It simply does not make sense to move them back and forth. Unfortunately, this can make your construction equipment a target for theft costing tens of thousands if not hundreds of thousands of dollars. Luckily, any vehicle or piece of construction equipment can be tracked and monitored in real-time using the RavTrack AVL tracking solutions from Raveon Technologies. With RavTrack, you know with certainty where all your work site assets and equipment are located; all in real-time and without the expensive recurring fees that accompany most other AVL systems. Using RavTrack AVL, you can monitor your job site and keep an eye on how your equipment is being used, even in remote areas where other products fail.